In the heartland of India, Uttar Pradesh, last week a specialised hospital for elephants was inaugurated in Mathura’s ChurmuraVillage in Farah’s block. The first of its kind hospital has facilities such as wireless digital X-ray, laser treatment, dental X-ray, thermal imaging, ultrasonography, hydrotherapy, and quarantine facilities for elephants. Agra Divisional Commissioner Anil Kumar inaugurated the first specialised elephant hospital on Friday. The hospital is built entirely with private donations and Corporate social responsibility(CSR) support. It is built next to an Elephant Conservation and Care Centre (ECCC) run by NGO – Wildlife SOS. 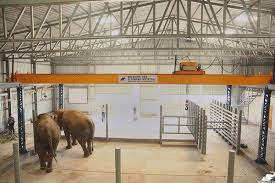 The Wildlife SOS Elephant Hospital is designed to treat injured, sick or geriatric elephants and is equipped with a medical hoist for lifting elephants requiring critical care, a pathology laboratory, digital weighing scale, Elephant Restraining Device (ERD) with a dedicated indoor treatment enclosure for longer medical procedures. An observation deck will allow veterinary students and interns to observe and learn elephant treatment routines from a safe distance. India’s first elephant hospital is jumbo sized with a built-up area of nearly twelve thousand square feet with observation area for overnight monitoring of elephants under treatment using Close Circuit Infra-Red CCTV cameras. Training courses will be organized by Wildlife SOS to spread knowledge on elephant medical care, humane elephant management and veterinary procedures to spread compassion. Additionally, Geeta Seshamani, co-founder of Wildlife SOS said that the hospital would put India on the map as a scholarly destination for humane management of elephants. She also noted that this step would go a long way to address the protection and conservation of elephants in India. The first elephant conservation and care centre were established in 2010 by the Wildlife SOS, the non-profit which is behind the hospital. The NGO currently looks after 20 elephants which are in need of specialised treatment, reported The Economic Times. Elephants in India are revered as embodiments of Lord Ganesha, who according to Hindu belief, is the remover of obstacles, patron of arts and sciences, and lord of intellect and wisdom. A huge part of India’s culture comprises elephants for their majestic appearance and historic significance. Festivals and processions, mostly in the south of the country, often involve elephants. However, animal rights activists say that their mahouts often ill-treat these little giants. Many elephants fall prey to electrocution, poisoning, poaching, and train accidents. In many incidences, the elephants were held captive and teased with metal hooks to subordinate them. As government data shows, the elephant population fell from 29,391-30,711 in 2012 to 27,312 in 2017, reported Reuters. “I think by building a hospital we are underlining the fact that elephants need welfare measures as much as any other animal,” said Geeta Seshamani. The Logical Indian salutes Wildlife SOS for its effort to create something so unique.